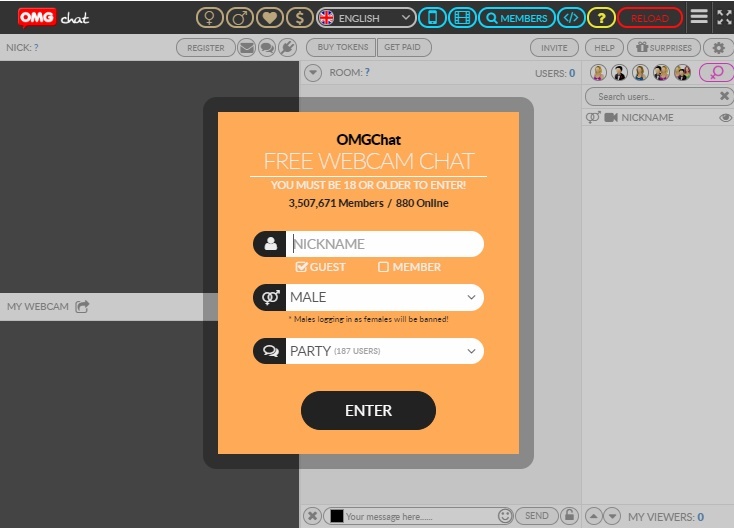 OMGChat is a free webcam-based chat community that allows in communicating easily with people from all around the world. Thousands of users are associated with OMGChat community for their easy accessibility and convenience in chatting and sharing their thoughts and idea with different kinds of people around the globe. The website welcomes people from all walks of life and several countries in the world to join their community. Along with normal chatting, the website also provides the option for video chatting with random strangers or known people whom the users meet in this website. The main attraction of the website is it does not charge any fees and membership from the users, and no webcam is required for chatting. The website provides free webcam chatrooms for its users that allow watching up to four live webcams at once and visiting many themed video chatrooms. The users can find someone he or she likes and invite them to a private cam2cam video chat. Each room can hold up to 200 people on camera and can do text chat. All the rooms provided are free for all the users which serve as the main attraction for the chat lovers for getting associated with OMGChat.